We are thrilled to have Stephanie Miles on board to assist the Museum with its annual Old Fashioned Christmas and Outdoor Artisan Market. She is currently studying Event Management at Algonquin College and is acquiring her field placement hours with us to gain experience in planning and executing events. You may recognize Stephanie from her previous work at the Museum. 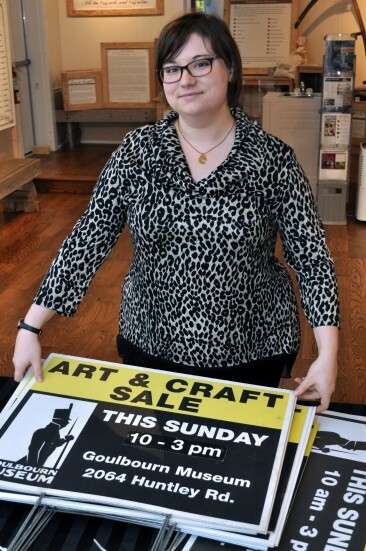 A graduate of Algonquin’s Applied Museum Studies program, she has completed co-op placements here, held part-time and contract positions, and volunteered at numerous events and programs over the years. Stephanie has jumped in with both feet and has already set a plan in motion to increase our social media outreach with the use of a SnapChat filter during the event. She is also creating a site map to help generate a positive flow of foot traffic to all of the attractions at the Old-Fashioned Christmas. One of the most in-depth projects Stephanie will undertake during her placement is developing a functional critical path for the annual event. This critical path will not only provide useful documented information for Museum reports but also provide future Museum employees with a detailed outline of every single task from the beginning of the event to the end. 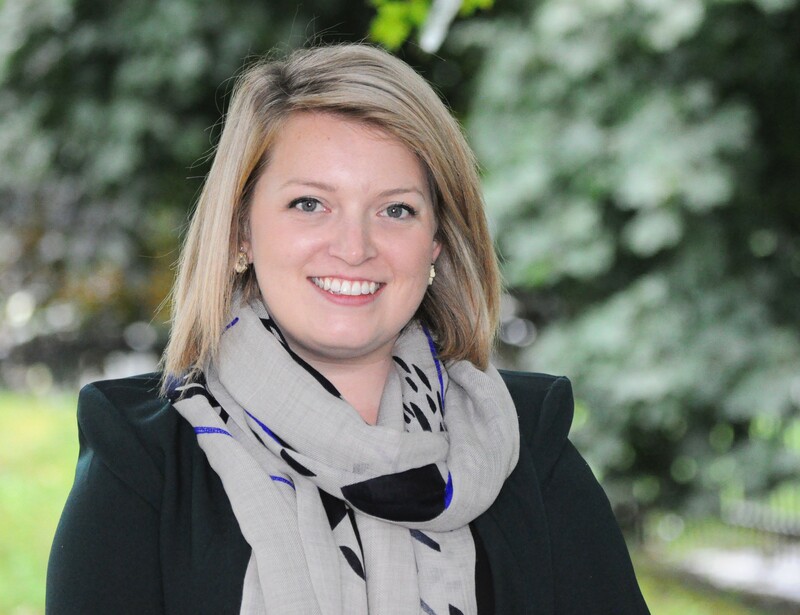 Stephanie hopes to gain knowledge and experience in the planning process for indoor and outdoor events that take place during Canada’s winter season. She plans to combine her museum training and her current event management knowledge to ensure a most memorable event for staff, volunteers and attendees alike. The Museum’s Old-Fashioned Christmas & Outdoor Artisan Market takes place on Sunday, November 18th from 10 a.m. to 3 p.m. This holiday celebration and Christmas market features activities for the whole family. Write letters to Santa and pose for a photo with the jolly old soul, watch a bona fide blacksmith at work, enjoy free hot chocolate and apple cider, roast marshmallows by the fire, and buy one-of-a-kind handmade gifts from local artisans. Admission is free! A vibrant collage of crocheted poppies now adorns the southeast corner of the Goulbourn Museum. 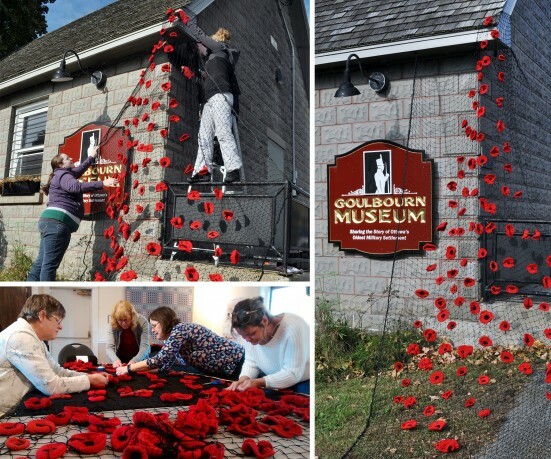 The art installation entitled “Poppies of Goulbourn,” was created by volunteers of the Museum’s Yap & Yarn fibre arts group and recognizes the significant military contributions of the community since the War of 1812. It was mounted on the historical building by Museum staff to ensure any conservation concerns were met. This year’s collage is a pilot project. The Museum’s goal is to work out any kinks and launch a much larger installation next year. “Starting on a smaller scale allows for trial and error and gives us an opportunity to create a successful plan for 2019,” says Sarah Holla, Collections and Education Officer. “Our aim is to open this up to the community and local groups. We would love to get people of all ages making poppies, from retirees to Guides and Scouts,” says Holla. Caitlyn McDougall, the Museum’s Programming Officer, will take the lead on next year’s poppy project which will launch in January 2019. Members of the Yap & Yarn fibre arts group will continue to play an active role and have also offered to teach the art of poppy making next year. “This art installation is a visual reminder of the military contributions made over the years by the men and women of Goulbourn and celebrates our history as Ottawa’s first military community,” says Tracey Donaldson, Manager and Exhibitions Curator. “Poppies of Goulbourn” will be featured at the Museum until Remembrance Day. I feel extremely fortunate to be a new member of the Goulbourn Museum team as their Collections Administrator! My previous work and education experiences vary and include work in the trades and other fields that have shaped me into the cultural institution professional that I am today. In 2018, I graduated with Honours from the Applied Museum Studies program at Algonquin College. Over the last 3 years, I have gained work experience in museum, archives and gallery settings. I have experience working with both national and municipal collections handling a variety of different mediums, artefacts and documents. Examples of my roles for institutions include: Student Archival and Museum Collections Assistant with the City of Ottawa Archives, Technical Services Intern with the National Gallery of Canada, Archival Intern with Ingenium – Canada’s Science and Technology Museum, and Contractor with the Canadian Museum of History. Additionally, I’ve worked for the Canadian Museum’s Association as a Database Research Assistant and Young Canada Works Support Staff. Each institution offered invaluable opportunities to work in the field and to handle, describe, interpret, rehouse and inventory diverse museum and archives collections. I am from the city of Sault Ste. Marie, or as many people like to call it, the “Soo”. One of the first times I remember being inspired by the museum world was when I was as a child visiting the Old Stone Heritage House, a.k.a. the Ermatinger Clergue National Historic Site. This site depicts the domestic and professional life of early settlers of the early 19th century and provides interaction with costumed interpreters as they performed every-day traditional activities. Additionally, I have fond memories of visiting the Canadian Bushplane Heritage Center which offers visitors the chance to make paper airplanes and tour the hanger full of their collection of planes. I specifically remember climbing into the cockpit of one of the planes and that memory as a child had a profound impact on me. My personal experiences with museums gives evidence to the importance of community institutions and the long lasting impression that a museum can have on its visitors. In my time away from work, I enjoy watching hockey and baseball, particularly the Toronto Maple Leafs and Blue Jays. I love music of all kinds, and I play drums and some guitar. I also enjoy hiking, camping, photography and of course, visiting museums! I’ve been in Ottawa since 2010 and I absolutely love living here – I believe Ottawa is a city that all Canadians should experience and see. 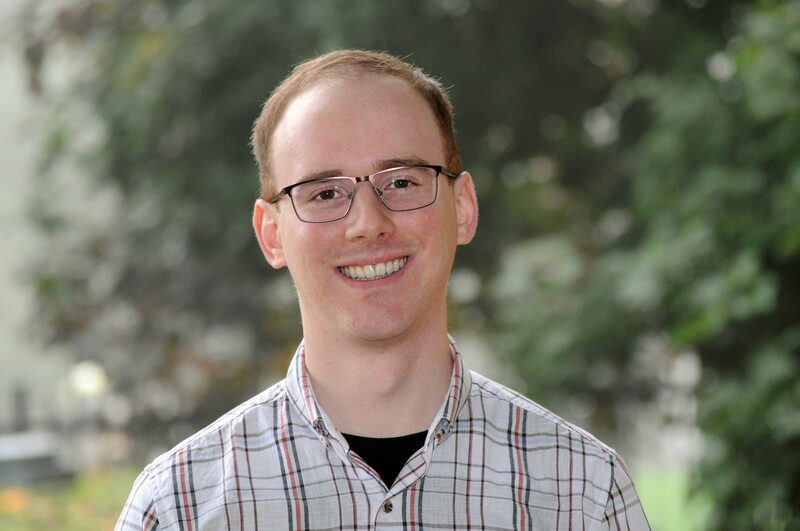 I am very happy to officially begin work in my new role with the Goulbourn Museum and I believe I have been given the opportunity to make a meaningful contribution to the team and their collection. I look forward to the new challenges and most of all – to meeting and connecting with everyone in the local community. I am ecstatic to be joining the Goulbourn Museum’s team as Programming Officer while Sarah is on maternity leave. I am coming to you with a background in art education and experience interpreting in both gallery and museum settings. I completed my degree at OCAD University in Toronto, interning at the Art Gallery of Ontario as an Education Officer. It was during a tour I was leading to the newly opened Frida Kahlo exhibit when the museum bug bit me-and I’ve been passionate about museum education ever since! I worked at the Robert McLaughlin Gallery in Oshawa, the Museum of Brands, Packaging and Design in London, England, the Marie Dressler Foundation and the Sifton-Cook Heritage Centre in Cobourg. Most recently I worked at the Art Gallery of Northumberland as Coordinator of Public Outreach and, since moving to the Ottawa Valley, Programming Coordinator at Ottawa Summer Solstice Indigenous Festival this past summer. When I’m not painting in my studio or frequenting museums you can find me hiking trails with my rescue dog, Boone. I’m so excited to get started in my new role and to be joining such a vibrant and historically rich community. I will be continuing to support with gusto all of your favourite tried and true programming—but watch this space, because we have some exciting new programs coming up! Come meet me! I will be on site during operating hours and would love to chat about what you want to see happen at your museum.